It’s Wednesday Dec. 6th and the Green Box is out again! This week we are featuring Mikimoto, the legendary brand of pearl and inventor of the pearl culturing process. Dedicated to protecting and propagating stocks of native akoya oysters depleted by over-harvesting of natural pearls, Kokichi Mikimoto became fascinated with the possibility of producing cultured pearls and in the late 1800’s, Mr. Mikimoto figured all out and the rest is history. 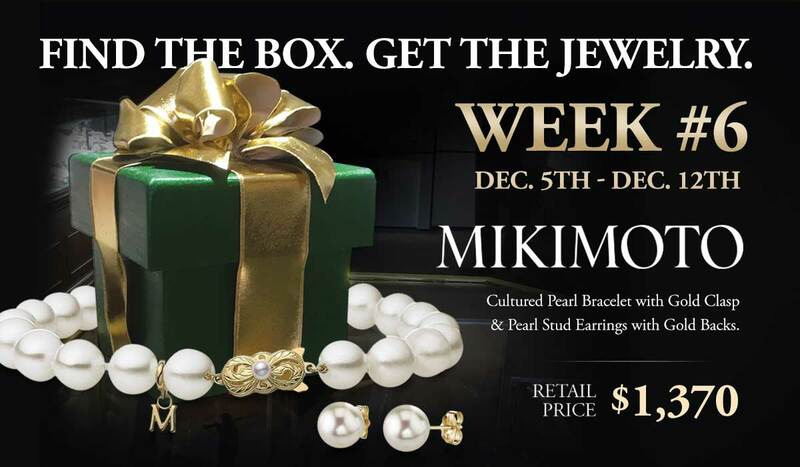 The piece of the week the box finder will receive is a Mikimoto Cultured Pearl Bracelet with Gold Clasp and Pearl Stud Earrings with Gold Backs. The set retails for $1370. Please keep in mind, that our box is not hidden in a place that is dangerous. If you would like a clue in a day in advance, come in and try on a piece of Mikimoto. The clues were based around Amanda Dickson, whose story is documented in the film A House Divided. She lived on 452 Telfair Street and the house is still there. Wednesday Dec. 6th Clue: The center of attention, yet not well attended. Thursday Dec. 7th Clue: The heat of the day was thought to be the beginning of the end. Friday Dec. 8th Clue: The breaking of barriers.